There comes a point in every gamer’s life when they want to do something big. 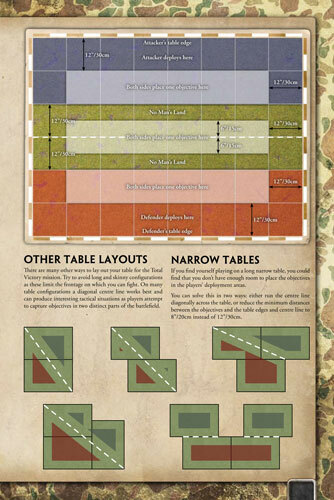 Total War is designed to do just that—put big armies on big tables. Instead of a mere company, you can field your entire collection at once. Just think, thousands of points of Flames Of War troops arrayed across a large table, multiple companies under your command. The infantry holding the line on the right while the tanks advance forward on the left. The ebb and flow of battle begins, your tanks rolling up the enemy force as it advances on the left, your gallant infantry first holding the line then surging forward on the right. With the battlegroup rules you have the chance to put any size force on the table and go head to head with someone else. There is no limit to the points you can field, so long as the table is large enough. And how much better are the bragging rights once you have beaten your enemy on a 20 foot/six metre-long table? Total War also gives you a chance to change the flavour of your games, get a bunch of friends together, and play a big multi-player game. Instead of facing your friends across the table, join forces with them to take on another team of friends. Order some pizza and drinks and make a real event of it! Total War is a large point level game of Flames Of War, played by two or more players. In normal games you tend to play at the company level, with games averaging about 1500 points or so. 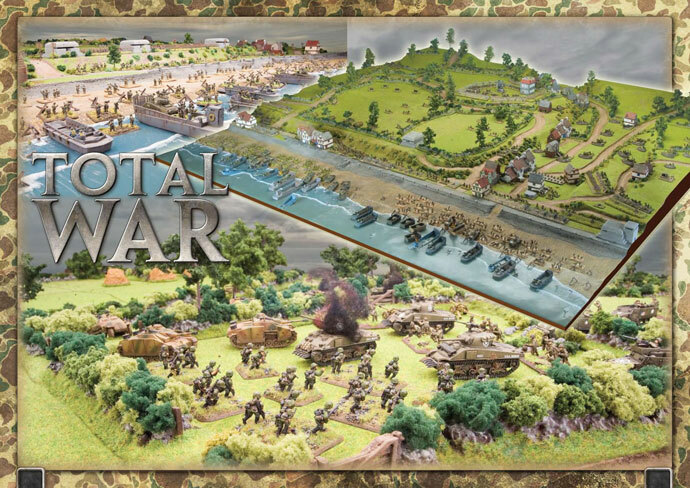 However, in Total War you will fight alongside other companies, forming a battalion level game with armies on both sides worth 4000 points or more! Total War is geared towards having fun. It is more of a social game than a competitive one. To that end, the Total War rules and missions are designed to be fun and intriguing. Though the forces are balanced against each other, Total War is not entirely focused on who are the winners and losers but rather on making sure all players have a fun and interesting game, while also giving players the excuse to do daring things, field odd forces, or play with a lot more points than they’d normally get to use on the battlefield.